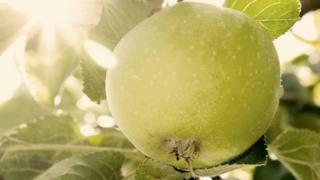 About 90,000 people are expected to celebrate the 150th anniversary of the Granny Smith apple in Australia this weekend. But who was the English emigrant who gave her name to the famous fruit? In the 1860s, in the farming community of Eastwood, 10 miles or so north of Sydney, an unusual apple tree could be seen growing along the banks of a creek. Its fruit was notable for its large size, light-green skin and suitability for both cooking and eating raw. The tree grew so abundant that its branches were later claimed to have been propped up to stop them breaking. How it originated is not known for certain. But according to legend, the tree grew from the discarded core of a crab apple thrown out of the kitchen window by a farmer’s wife – one Maria Ann Smith. This legend is born out, to some degree, by science. An entirely new variety of apple, such as Granny Smith, could only grow from cross-pollinated seeds within an apple, said Amanda Karlstrom, of UK horticultural research firm NIAB EMR. The parentage of the Granny Smith is thought to be possibly a cross between a cultivated apple and malus sylvestris, a crab apple. “Therefore, Granny Smith is most likely a chance hybrid of two existing varieties and/or species,” Ms Karlstrom explained. “The clever bit that Ms Smith did was to identify the potential of her young plant, nurture the seedling and propagate it for wider apple production. Could the real Granny Smith have brought this knowledge with her to Australia from the other side of the world? 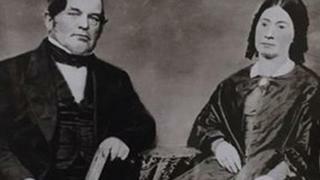 In 1838, the Lady Nugent had sailed into Sydney with nearly 50 emigrant families on board including the Smith family – Maria with her husband Thomas and their five surviving children. 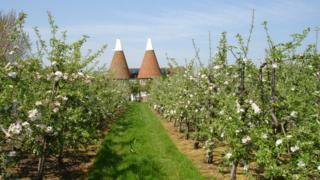 Back in England, the Smiths had lived in the village of Beckley, in Sussex, surrounded by the orchards of the Weald. It seems likely Maria had spent her life in in England on fruit farms, according to Prof Brian Short, of Sussex University. “We definitely know Maria was from an area which had some specialism in apples,” he said. Records suggest Cherry Gardens, a farm in the area specialising in hops and pears, may have been tenanted by her father-in-law. However, conditions were tough in England in the 1820 and 30s and it appears the Smiths fell on hard times. The end of the Napoleonic Wars had led to a labour surplus and depressed wages for farm labourers. At the same time, increased mechanisation had reduced demand for agricultural labour. Poor, hungry and increasingly angry, rural families took action in the summer of 1830 as the Swing Riots broke out in neighbouring Kent and soon spread to Sussex. Beckley would have been right “in the eye of the storm”, said Prof Short. It was “one of the most pauperised parishes” in the county, according to the guardians of the Rye Poor Law Union. “We are in the greatest possible distress for want of labour at the Rye union board,” wrote parish official Samuel Selmes. The solution, officials decided, was to send people abroad. By November the parish had paid for about 200 people to be taken to Australia to begin new lives. Maria, Thomas and their five children were among them. 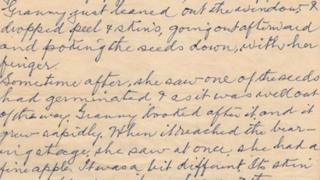 A letter written decades later by Granny Smith’s grandson, Benjamin Spurway, describes how the family found employment in Australia before taking on land for themselves and establishing an orchard. The letter has only recently come to light after lying undiscovered for decades. The land was heavily-timbered, he wrote. “Much hard work, determination and courage were needed before the land was cleared, ploughed and cultivated and ready to make a fruit orchard, which they decided upon. “The day came when their ambitions were realised and a beautiful orchard took the place of wilderness. Spurway goes on to tell how Thomas Smith took on a market stall to sell the fruit but came back penniless after he stopped at the pub. At that point, Maria took over the stall. It was at the market another fruit producer gave her a batch of crab apples to test their cooking qualities. According to her grandson, she made two pies, dropped the peelings and cores out of the window, and the first Granny Smith seedling grew. The family records the first Granny Smith apple was produced in 1868, two years before she died. 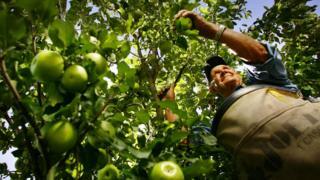 Later, the apple grew in popularity and went on to become one of Australia’s major food exports. Today it is grown around the world. In Eastwood, which long ago became a suburb of Sydney, the bountiful fruit that made the area prosperous is still remembered. 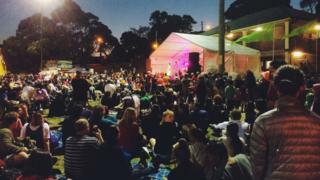 A Granny Smith festival has been held each year since 1985 and is attended by tens of thousands of people. However, the Smith family did not become rich. “Fruit can’t be patented, and I often think how rich we could have been if it had have been different,” said Sue Butler, who is Maria’s great-great-great-great-great granddaughter.